Google Image Labeler isn’t that new of a service anymore, but I wanted to write a post about it so anyone who hasn’t heard of it yet gets the chance to play with it. You can start the game either as a Guest, or if you’re logged in, you can create a nickname for better score keeping. Once you hit the “Start Labeling” button, you’re randomly paired up with someone else online. You’ll both have two minutes to start labeling the same sets of pictures with tags that you believe describe what the images show. 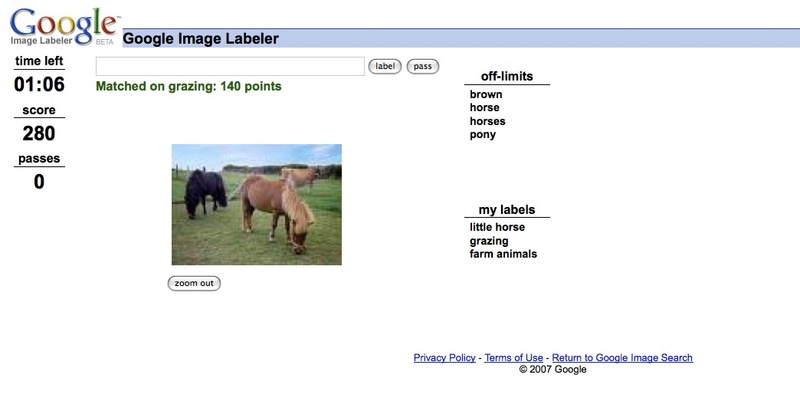 If you’re labels match your partners, you’ll get some points, the amount depending on how specific your labels are. Once you start playing, you’ll be able to start making guesses, but there’ll be a list of phrases that you can’t use. I don’t know if you’re penalized for accidentally using them though. I typed ’em several times, because I was just trying to make as many guesses as I could before the time ran out. When the game’s over, you’ll get to see how many points your team scored and what your partners guesses were for the same images.